The new season of Stranger Things dropped this weekend on Netflix - and I'd be lying if I said I didn't watch the entire season twice through already. Inspired by all things 80s themed and audio-synth tuned, I turned my kitchen Upsidedown by ripping a hole in spacetime and calling up some demogorgons. If you aren't caught up on both seasons of Stranger Things, be warned: there may be mild spoilers in this post! The demogorgon was the main nemesis on the first season of Stranger Things. In season two, the demogorgon is back and more horrifying than ever - a wicked fast demogorgon-dog hybrid controlled by the oh-so-mysterious smoke monster. But here's the thing about the demogorgon - it's entire face is a giant mouth, intent on devouring you. My meatloaf imitates the terrifying fanged mouth of the demogorgon, but this time, YOU get to bite back! Of course, what Stranger Things feast is complete without some Eggo waffles? 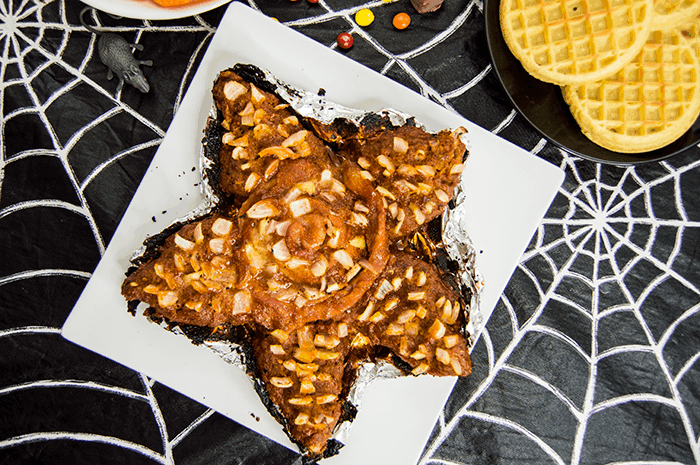 I served mine up a la "chicken waffles" style and made a fun version of "demogorgon waffles" instead. This season of Stranger Things was awesome and actually sets up a third (and probably more) seasons to come after. The gang has more to worry about than just demogorgons in the future. I'm ready to binge watch the entire series again and again until then - and dine on demogorgon to tide my appetite for the Upsidedown. Preheat the oven to 375 F. In a small bowl, stir together the ground turkey, plain bread crumbs, garlic powder, paprika, red pepper flakes and parsley until completely combined. Spread the mixture out onto a greased, foiled lined baking sheet and form into the "face" of a demogorgon. In another bowl, stir together the sriracha ketchup, Worcestershire sauce, garlic powder and maple syrup. Arrange the strips of bacon in a circle around the center of the "face" to separate the "petals" from the mouth-hole of the demogorgon. Brush the entire meatloaf with the sauce. Press 1/2 inch length pieces of onion into the meatloaf in the pattern of a demogorgon's teeth. Cover the meat load with foil and bake for 25 minutes. Uncover, brush on the remaining sauce, and cook uncovered for another 10 minutes. Use the foil beneath the meatloaf to push up the "petals" so it looks like the open mouth of the demogorgon. Serve hot along with some Eggo waffles and extra spicy ketchup. Enjoy in the Upsidedown while binging Stranger Things.